Cedar Grove, N.J.-based Plast-O-Matic Valves Inc. has introduced a compact, low-cost polypropylene solenoid valve for applications using water or mild solutions. 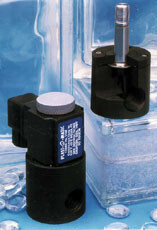 Series WC is a direct-acting solenoid valve rated for full vacuum through 125 psi. The extended pressure range is made possible by a wetted-core design, which means that the process liquid will be in contact with a limited area of metal parts. The wetted metals are 300 and 430F stainless steel and silver, which are compatible with a wide range of liquids.